I have a RPi3 driving a robot and I've built a dual H-bridge circuit to run it. I have seperate fuses for the RPi and the driving circuit and I'm glad I do! Trouble is, when the RPi is off, the H-bridges enter into a shorted state from +V to GND. At the moment, I'm pulling the fuse, turning on the pi, and awkwardly putting the fuse back in once powered up and I can ensure a safe state. As it's a P-channel and an N-channel half h-bridge, if all outputs are equal then it's actually fine (this was my logic in designing it) but I've found that GPIOs on INPUT still trip the fuse. Question: Is there a way to specify the "powered down" state of the GPIO pins? Alternatively, if I supplied a 10k pulldown resistor to ground on each GPIO channel will that allow the BJTs to be in a known state when the RPi is powered down? Browse other questions tagged gpio boot-issues pi-3b+ or ask your own question. 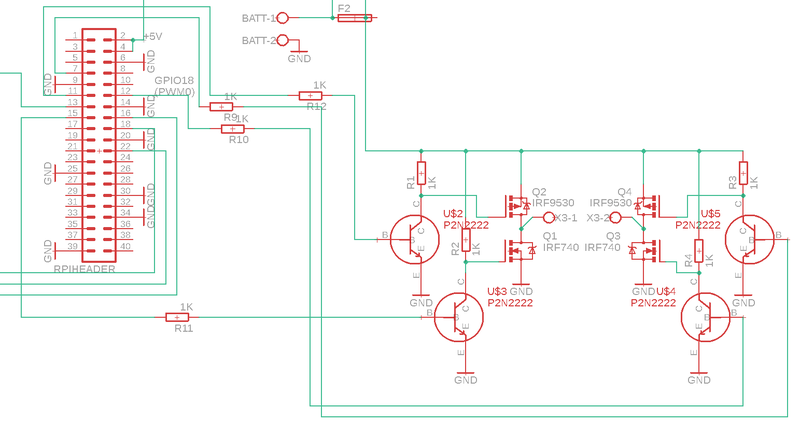 Is it safe to leave stuff connected to the GPIO pins when the Pi is powered off?